You know the reaction. The one you get when you’re out for breakfast and you order oatmeal….. the nose scrunched, shocked stare from across the table. And then the slew of questions — “are you sure you don’t want the eggs benedict? or how about french toast? are you trying to eat healthy? that’s so boring.” This probably coming from the person who was served super sweet maple brown sugar instant oatmeal packets as a kid, with the gummiest texture, that got even worse as they sat with one hand on their head, the other holding the spoon, defying to eat it. But really, oats are one of my favorite things to eat. Naturally a little sweet and nutty, versatile, full of whole grain power, cheap, cozy, and satisfying. Muesli is made of oats and accompaniments, sort of like an un-baked, raw granola. It originated in Switzerland and is quite popular around Europe, but I’m seeing it much more often in the US these days. Comprised of dry, rolled oats and sometimes other grains, nuts and seeds, maybe flaked coconut, warm spices, and dried fruit, muesli is like the chex mix of oatmeal. And I love it. Cold, soaked muesli is great in the summertime, and keeps the ingredients in their purest form. But I also like to make it warm via a breakfast bake, and change the fruit that sinks into its top as the seasons change. And during the summer, it changes nearly weekly, as the peak season for each fruit comes and go quickly. 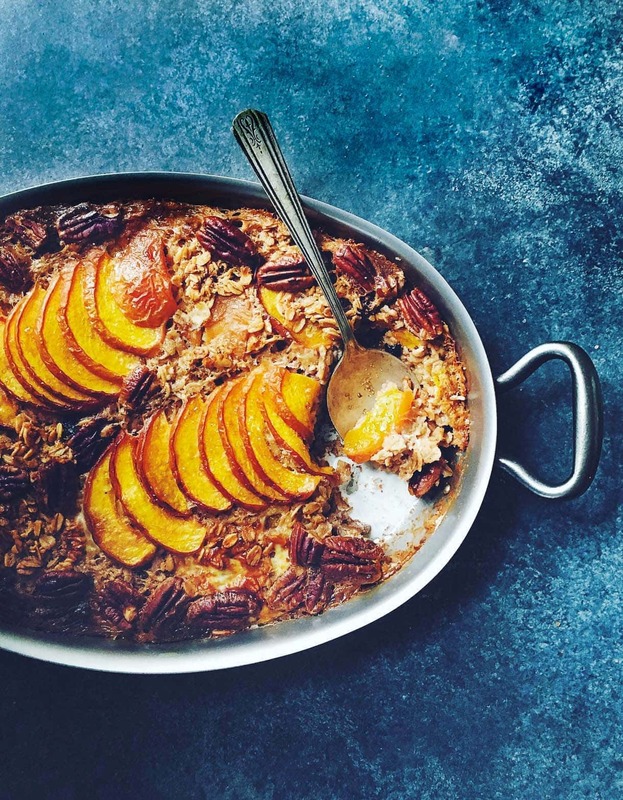 In July, it was cherries and blueberries, in August, this Peach Baked Muesli, taking advantage of the stone fruit gold mine. It’s quite easy and memorable, one you probably won’t even need the recipe for once you make it a few times. Muesli, milk, butter, a little bit of maple syrup, and one egg. The liquids are whisked to wet the dry mixture, and layered with fruit and pecans in a large pan. 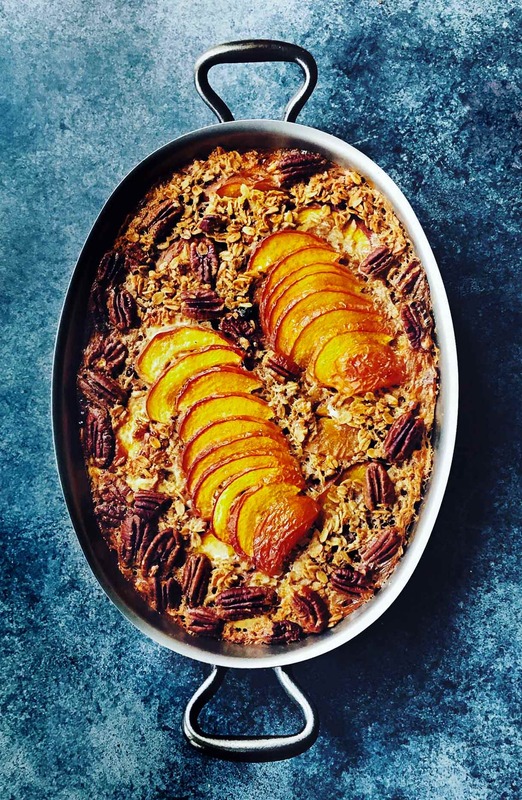 At first you’ll think there is way too much liquid, but it has a purpose, softening the oats and accompaniments in the muesli, and keep it moist throughout the baking process. I can’t get over the intoxicating smell as it bakes, the cinnamon and nutmeg mingling with the fruit, and the pecans toasting away. It comes out tender and sliceable, full of flavor despite the simplicity. And perhaps the biggest benefit is that it makes a large batch, perfect for baking on Sunday and eating throughout the week, warm or cold. Sometimes I top the squares with a dollop of yogurt, but always, always a drizzle of pure maple syrup and a splash of cream. Whisk together the dry ingredients. In a separate bowl whisk together the maple syrup half and half, milk, egg. Pour this into the bowl with dry ingredients, and stir to coat and combine. Grease the bottom and sides of a high lipped casserole pan, approximately 7x11. Spread half of the oat mixture into the bottom, then top with half the peaches and half the pecans. Scoop the remaining oat mixture onto the top and evenly disperse to cover the peaches. It is okay to leave the liquid in the bowl, you'll use it. Then top with pecans and remaining peaches, putting in a pattern if you like. Then pour the liquid left in the bowl evenly over everything. Drizzle melted butter over top. Bake for 35-40 minutes, until liquid is absorbed and top is browned. Cut into squares and serve with a drizzle of cream or yogurt, and maple syrup. Cinnamon, nutmeg, peaches. Be still my heart. 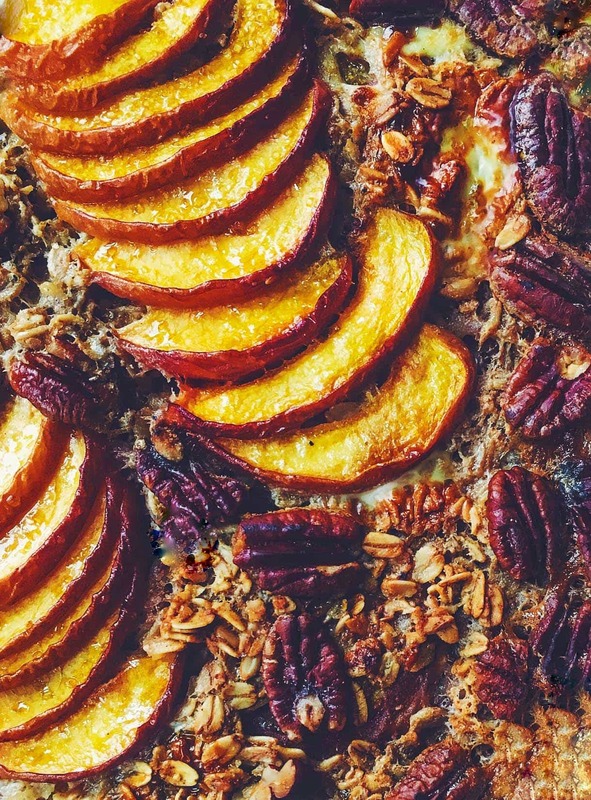 I love this bake so much, and can’t wait to make it with apples too. xo! Mmmm yummy! I love oatmeal and bircher muesli and everything granola related, so I’m sure I would love this recipe as well! We eat a ton of muesli here in Sweden, but I’ve never actually seen a baked version of Bircher Muesli (overnight muesli). Only baked oatmeal, but sometimes it can be a little boring with only oats. Will try this recipe soon <3 I can imagine it spreads the most wonderful smells in the kitchen! Ughhhh I also LOVE oatmeal and order in restaurants, no shame here! 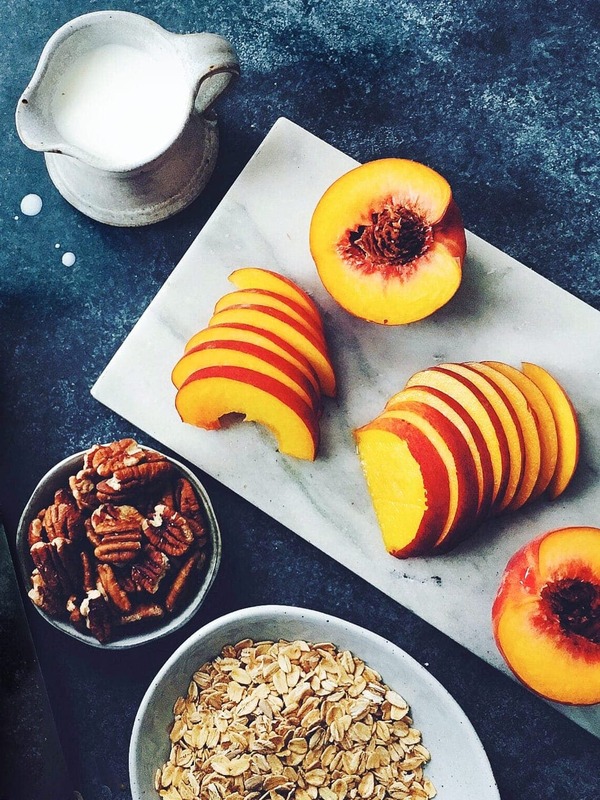 I’ve actually never really tried muesli, but this would be a great recipe to start! Drooling! Oatmeal is my go-to breakfast, because I love how versatile it can be! 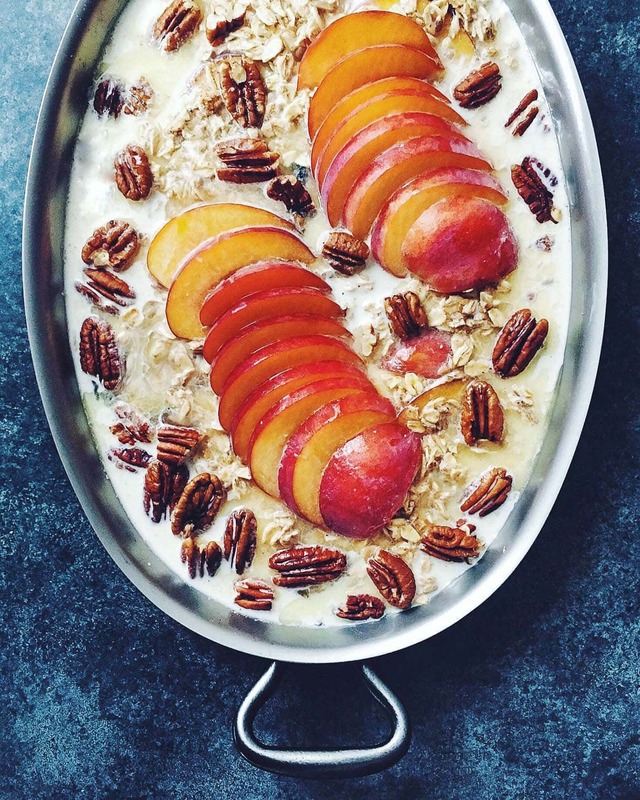 I need to try this baked muesli soon! What a beautiful presentation of muesli! thank you so much jennifer! sunken fruit is such a pretty thing. 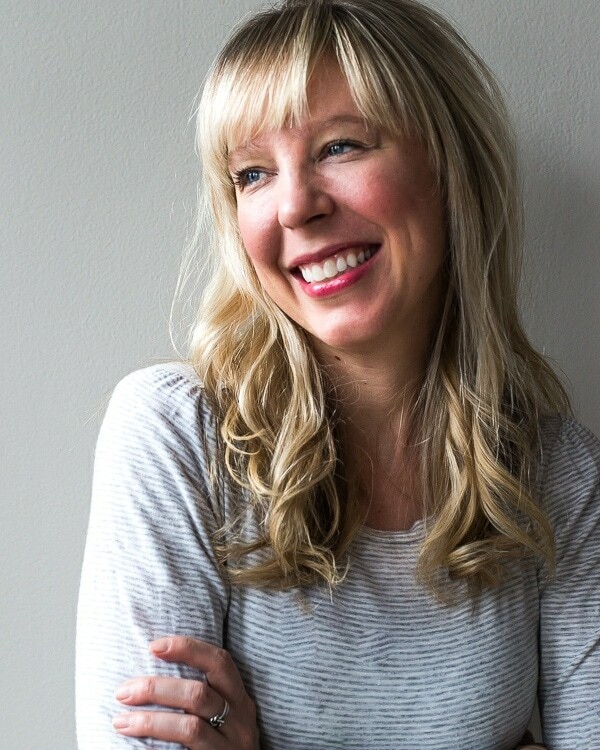 I just stumbled on your blog and was reading your bio – I, too, am from New Ulm :) I moved to the cities when I was 13 months old (Prior Lake…now Lakeville), but my sister and her family still live there. I look forward to following your posts now! THIS one in particular…yum! Sounds and looks incredible! This is such a great idea! I like cold oatmeal, but not in winter time, but don’t like cooked porridge so much, so this looks like a great in-between. Definitely giving this a try and pinned it for later. Thanks!